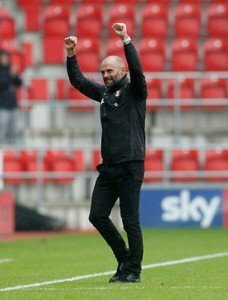 Rotherham United Manager Paul Warne says he thought his team created a lot of chances in the first half of this afternoon’s win over Derby County. The Millers might have created a lot of chances but the only one they put away, which was a crucial one, was the penalty in the second half which Kyle Vassell won and Ryan Manning scored. Warney told iFOLLOW that he was a bit disappointed that his side didn’t go in leading at half-time and, as expected, Derby came at the Millers in the second half. Admitting that he was a ‘bit panicky’ when Manning stepped up to take the spot kick Warney was pleased to see that the loanee from QPR calmly slotted the ball in for the lead and ultimately the win. The last penalty the Millers got was at Wembley in the League One Play-Off Final and was missed by David Ball so all of us in the stands were wondering who would take the spot-kick, once the referee had consulted with his linesman and given it. A couple of Manning’s corner kicks had gone a little awry today but the lad certainly made up for it with a lovely penalty into the corner of the net. The three points are a big thing for Rotherham United giving them nine points from three home wins this season, which as it stands, is one more than Nottingham Forest and Norwich City and just one less than Aston Villa, Blackburn and Wigan Athletic. The Millers have two away games now – firstly against Aston Villa on Tuesday who drew away at Blackburn this evening and then against Nottingham Forest who played out a goalless draw at Swansea today. Two points from those two games would be great results, anything more would be a bonus.